Problem solvers, creative thinkers, and new business builders. Put your talents to use where opportunities are limitless and every day makes a difference. Whether you’re an experienced professional or a recent graduate, working with Synergy Consulting could be a challenging and rewarding next step in your career. Problem solvers and creative thinkers. Engineers and new business builders. Put your talents to use where opportunities are limitless and every day makes a difference. Whether you’re an experienced professional or a recent graduate, working with Synergy Consulting could be a challenging and rewarding next step in your career. At Synergy, our human capital is the key driver for our growth and effectiveness. We believe that sustainable success can be reached only through our people. No other asset in our Company is as important as the people who contribute with their work to our culture and business results. Synergy offers unrivalled opportunities to its team members to succeed and realize their highest potential. Our policies and benefit programs strive to seamlessly integrate our people and processes across the entire human resource life-cycle. Talent acquisition, performance management, employee development, employee engagement and merit-based rewards are performed with the objective of retaining and building our talent pool and providing an amiable work-place environment. Continuous learning process is facilitated across all levels at Synergy through blended learning approach of in-house programs and external trainings encompassing behavioral, technical and management areas. Our Knowledge-Sharing sessions help expand the skills of our team members. Whether you are an experienced professional or a fresh graduate from a Business School, working with Synergy can be a rewarding next step in your career. Under the Young Professional Program — Synergy YP Umbrella — Synergy brings in external trainers for in-house Exercise, Yoga, Meditation which Synergy team members find very useful and much enjoy. Two hours, four teams, trial and error, working as separate teams. 25 Seconds to Success with Four Teams Collaborating!! We value the expertise and fresh insights that our experienced new hires bring to Synergy. Only with the best minds and diverse perspectives can we consistently add value to our stakeholders in Infrastructure Development & Financial Advisory. Synergy gives you a platform to achieve your highest potential by working with a team of colleagues and clients on challenges that matter the most to them. You get opportunities to leverage your business knowledge and experience in diverse sectors and geographies or contribute your expertise to a specific industry or sector. If you’re looking for a work-place which values your curiosity, passion, and desire to learn, if you’re seeking colleagues who are big thinkers, eager to take-on fresh challenges as a team, then you’re a future ‘Synergizer’. Synergy recruits well-rounded, inquisitive candidates with a track-record of outstanding academic performance and high learning agility. When you join us, from early on, you get hands-on client responsibility and the support you need to develop a breadth of skills and experience that will enable you to fulfill your highest potential. Opportunities are available to work across geographies, sectors, services to be able to take-on challenging and oftentimes, ground-breaking projects. 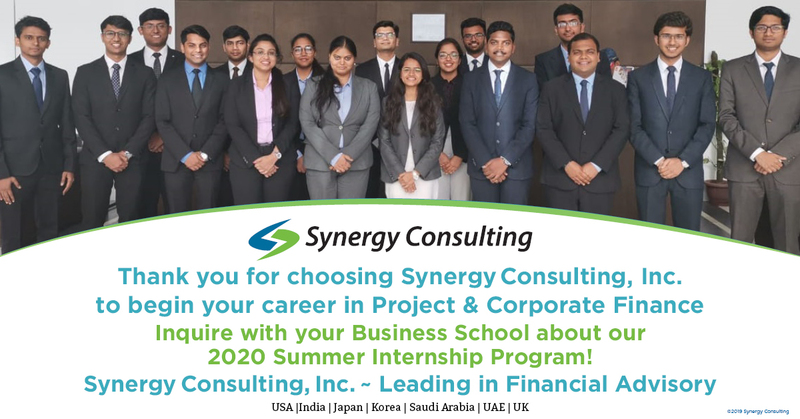 Synergy offers exciting internship opportunities to students of Tier 1 – B Schools in the penultimate year of their degree. Summer interns at Synergy get a firsthand view of what a career with Synergy has to offer. Students joining our Summer Internship program spend 8 weeks at a stretch with us. Synergy interns work as an integral part of our client service team on live projects and learn through experience of real time challenges and pressures of client projects. As an intern, you are trained hands-on with responsibilities of analyzing data, preparing client presentations, information memoranda and financial models. You get the opportunity to work closely with and be mentored by Synergy team members, which gives you a 360-degree perspective of Life @ Synergy. Working as an intern at Synergy is more than an opportunity to bolster your resume. It also offers the potential to launch your career at Synergy, as many of our interns receive offers for full-time position. “Synergy provides an exciting platform to learn various aspects of infrastructure business, with a steep learning curve. Ingrained with a culture of individual accountability, focus on high quality deliverables, and adherence to timelines, one can witness the growth both on an individual and at an organizational level. Synergy also provides an opportunity to work with the best brains in the business. The employees are typically hired from top B-schools, and get an opportunity to interact with Clients from day 1. Overall, missing a day at Synergy is akin to missing something well worth learning. “I strongly believe that behind Synergy’s great success is an entrepreneurial spirit. Meeting Synergy Team Members individually and as a team at Synergy 15th Anniversary Celebrations in New Delhi, clearly conveyed Synergy Team’s vibrant mindset. “Startup success stories mostly highlight entrepreneurs, business plans and innovation. In the beginning of the journey of a start-up, not much talked about are the people processes. Not much thought about are employee benefits. Taken for granted are first marketing materials and the nitty-gritty of everyday minutiae. Not thought about are volunteer service initiatives. The list is long. But we didn’t think about the length of the lists when we founded Synergy …We at Synergy believe in taking action. “It has always been our sheer pleasure to associate with Synergy team and mentors through various Campus Engagement Avenues and we feel much obliged to welcome Synergy. It reinforces our trust in the organization and your team, with our students, who I am sure are in the right hands in terms of being groomed to be the future leaders carrying forward this legacy. “During the Summer Internship Program at Synergy, I made a lot of memories with some of the best people one could find. Be it a fellow intern or an employee, people at Synergy work hard, party harder.